Fearing the loss of the deterrence of destroying terrorist homes, National Security Cabinet instructs demolitions be sped up. The IDF has found that the deterrent provided by destroying the houses of terrorists is being eroded. Not only has the Palestinian Authority (PA) begun to create social initiatives to raise money to rebuild the homes of destroyed terrorists, but the Israel Security Agency has found that many terrorists commit their attacks in the hopes of having their houses destroyed and thereby solve domestic squabbles. The IDF is warning that these trends may have adverse effects on the deterrent that is provided by destroying the houses of terrorists. Without giving specific examples, the army has told Israeli media outlets in the past that, according to investigations conducted by Israel Security Agency, many terrorists have set out to conduct attacks due to domestic fights. They perpetrate attacks in the hope that the IDF will destroy their houses. The National Security Cabinet has instructed that the destruction of the homes of terrorists be sped up. According to a report on the Walla news site, currently the process to destroy the terrorist's home takes approximately a year and a half from the time the decision is made. The cabinet would like to speed up the process and have houses destroyed within two months. Sources in the IDF's Central Command have said that destroying terrorists' houses puts strong pressure on the Palestinian Authority as the PA does not have the finances to rebuild the houses. 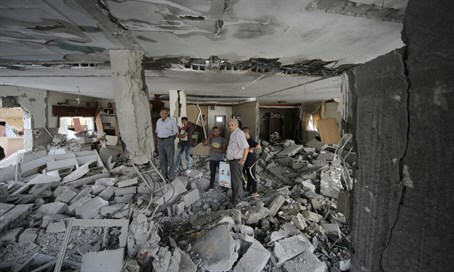 For its part the PA claims that the destruction of houses also harms nearby houses of innocent people, and incites the Palestinian people to further violence. Since the PA does not have the funding to rebuild the homes, Palestinians have begun to raise money via private donations and crowdfunding platforms to rebuild the destroyed homes. According to the report, such a campaign was initiated in Ramallah to fund the rebuilding of the home of terrorist Mohammad Shafik Halabi four days ago. Halabi murdered Rabbi Nehemia Levy and soldier Aharon Benita in the old city of Jeruslaem in October. Halabi’s house was destroyed on Saturday by security forces. Within one day the campaign had raised 150,000 shekels ($38,000 US) from Ramallah residents alone. Others donated stones and other building materials for the project. The PA has also instituted a new policy in which each public worker will donate one day of their time to rebuilding the destroyed houses. According to estimates by the IDF the PA has 145,000 public servants. Should each of them contribute one day’s worth of work, the total would equal approximately 25 million shekels ($6.3 million US).